Find hotel near Brocante Westland D'ander ..
Don’t let the far flung location of the Brocante Westland D’anderlecht flea market discourage you from visiting it. There is a good reason it has been going on since the 1980s without break. With over 400 second-hand dealers turning up to ply their wares to more than thousands of customers, no matter rain or shine, the flea market is one of the liveliest weekend events of the city. Seriously, if it begins to rain, everyone just heads indoors without batting an eyelid or breaking a stride. As for what you could find here? Anything and almost everything that you would ever want to buy in a flea market as a souvenir or to complete your some particular collection can be easily found here. May be closed on some sundays. Check the attraction website before your visit. Buses 75, 89, 116, 117, 118, 571, 572, 810m N13 stop at Fruits bus station. 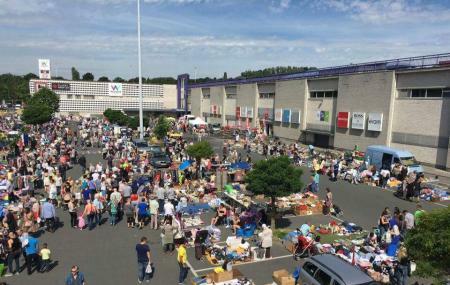 How popular is Brocante Westland D'anderlecht? People normally club together Flanders Field American Cemetery and Zinneke Pis while planning their visit to Brocante Westland D'anderlecht. People also prefer to start their day with Brocante Westland D'anderlecht. Here is the one of the best brocantes in Brussels. You'll always find something interesting for you.